Last year, I did my bucket list in July. Yeah, July.... I figured I could do better than that in 2016. So in MAY this year, I'm joining Shelly by linking up and showing off my bucket list just a wee bit earlier! + This is our first year with our very own pool so hence the huge emphasis on pools and swimming! + Our 10th anniversary definitely needs a celebration but it also needs some organising. I need to get on that! + This is my girls' first year of summer camps. They are stoked and so am I but I will miss having them home for the entire summer with me. + I saw the idea for a yes day on Katy's blog and thought 'yes please'! I basically say yes to everything my kids want to do. I'm sure they are going to get a kick out of that! + I usually do a combo of different and easy so that way we get to enjoy the awesomeness of summer! You can check out 2014 and 2015's lists also! Happy summer planning everyone!! !What's on YOUR list this year? Eeekkk I really need to wrap up my spring list. All of these summer lists going up have me feeling the pressure. I'm saving this to my desktop - I love all of these and way to go for planning ahead!!! The fact that you have your OWN POOL- ahhh!!!! Sooo cool. Will be so much fun!! And yay for your 10th anniversary!! So glad you linked up! Can't wait to read about your yes day and other fun items! I love a good bucket list! A yes day sounds epic! So many fun things planned! It must be awesome having your own pool, and I've heard of "Yes Day" before - so fun and such a great idea! Love the idea of a "yes" day! And I know you and your girls will enjoy your pool as much as we do! I'm stopping by to say Hi from Shelly's blog! Enjoy your weekend! So many fun activities for the kids and grilling is one of our favorite things to do in summer along with lots of pool/beach time! So I totally need to know more about this homemade happy hour!! I so love the idea of a yes day and my kids always love a pajama day. This is a super list and so much fun to be had. Can't wait to hear where you decide to go for your roadtrip! Thanks so, so much for linking with us!! I so wish we had a pool or that a membership was in the budget. 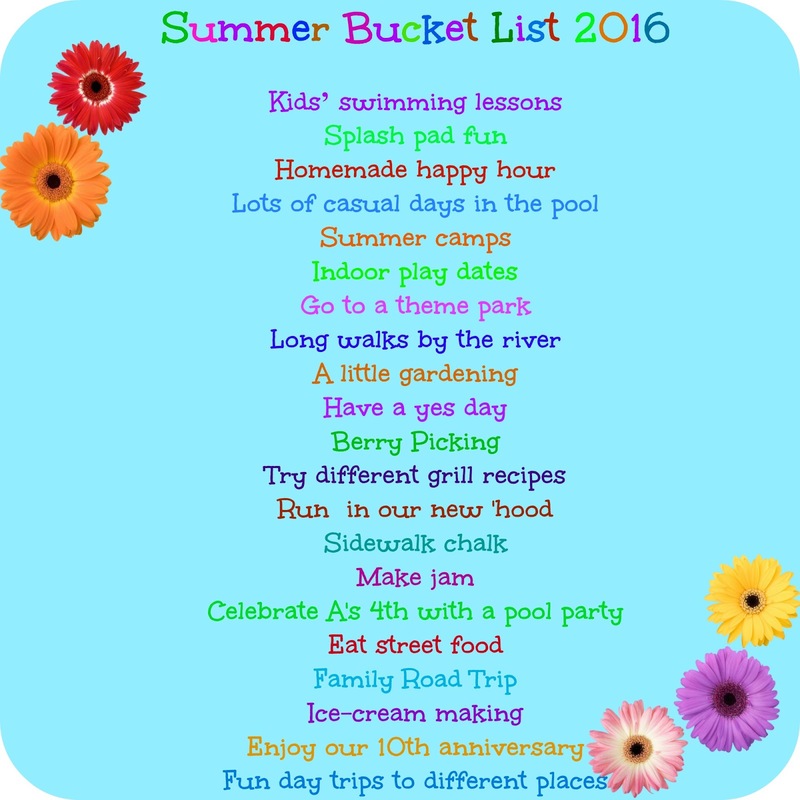 Your list looks full of fun!